OK, today I want to talk about heat output requirements. This is the one area that causes the most confusion and frustration to end users when selecting radiators. The main problem is that Joe Public ordinarily doesn't have much need to understand how their heating works or what their radiators do for them. Simply put, radiators on a central heating system are designed for the occupants of the house to avoid the feeling of cold. They're not designed to radiate heat in a blast like an open fire or wood burner. They just tick away, raising the overall temperature of a room in most cases, when specified correctly, to an ambient temperature of 20ºC or more. With this in mind, when we look at heat calculations, we have a number of resources available to us to choose the correct output radiator. Firstly, there are a huge selection of output calculators online. We have one on our site here. The problem with using output calculators is that it is simply maths. X+Y=Z. There isn't any interaction with how the room actually feels heat wise, the aspect of the room or how the occupant uses the room or what the occupant prefers, temperature wise. We actually removed our calculator from the menu section of our Radiator Showroom website as people thought the figures it supplied had to be adhered to like the Ten Commandments or something. Whilst we need to remain within a reasonable tolerance, of course, there is some waggle room. The second consideration is design. If you're here, odds are you're looking for designer radiators, contemporary radiators or traditional radiators. In other words, you're looking for something nice and attractive. When people focus in the radiator output, they can get carried away with Watts or BTU (British Thermal Unit) outputs and select huge radiators that look entirely inappropriate. In most cases, radiators are available in a number of sizes and where large output are needed, often its a good idea to split things up with two or more radiators. Most people are surprised to learn that costs for two radiators is usually very similar to one unit at double the size. Though they’re perhaps not the first design features that you think of when redecorating your home, your radiators can have a huge impact on the overall success of your finished design, and can make or break your home’s new look. Occasionally, you’ll spot a radiator that you love so much you build your entire interior design scheme around it, however, more often than not, choosing your radiators will be an natural part of completing your design and a great finishing touch in your home. So if you’re struggling to choose just one of our fantastic radiator designs, here are some things to think about to help you narrow it down. The very first thing to do before choosing a radiator is to work out exactly how much space you’ve got to install it in. If it’s going on a long, straight wall this won’t be too much of an issue, however if you want your radiator installed under a window, in an alcove or within a pre-existing radiator cover, you need to know that it’s going to fit. 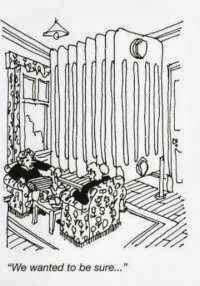 When calculating the size of the radiator that you require, remember to take its width as well as its height into consideration or you may be left disappointed. The destination of the radiator in your home will also have a big impact on the style that you choose. For example, if the radiator will be mostly out of a sight, a simpler design would probably do, however if the radiator is going to be in a prominent position then its design is going to be a lot more important. Our radiators are specially designed to cover a range of periods, so no matter what style you’ve chosen for your home, there should be a radiator to suit it. From the elaborately decorated to the all of our radiators have a huge amount of decorative appeal and can contribute a lot to any interior. All of our more intricate radiator designs would look fantastic installed in a home with existing period features, complimenting things like wooden floors, fireplaces and cornicing perfectly. If you’ve gone for a more contemporary look for your home, we’re guaranteed to still have the perfect radiator for your needs. Anything from the strong, clean lines to the modern rounded edges would look great in any home, giving a great designer touch to your central heating. Aluminium Radiators - What's so special about them? Aluminium radiators are quite a strange phenomenon on these shores. They're been around in Europe for decades, but they haven't been seen by us Brits, unless on our hols in the Costa Del Sunny. Recently, they've started becoming more widespread in the UK. So what's making people switch from our ingrained ideal of the pressed steel panel radiator to something that looks so different? As you probably know, aluminium as a material is incredibly lightweight, but many don't realise that its heat transference properties are tremendous. This makes aluminium a great choice to make radiators with. Another benefit of aluminium radiators is due to the great heat transfer, they don't need to hold a lot of water. This means you have less water in your heating system, which in turn means less water for your boiler to heat, which in turn means lower heating bills. On the subject of heating bills, many people are looking into alternative and renewable energy. Aluminium radiators lend themselves to solar, ground source and air source heating due to the low water and heat transfer properties they possess and the fact that an aluminium radiator will transfer heat at lower temperatures than a pressed steel panel radiator. From a production perspective, many aluminium radiators are modular in their design, consisting of die cast or extruded sections bolted together. This means you can buy sufficient sections for the space you want to heat and divide them according to the number of radiators you need without being stuck with the particular sizes offered by pressed steel panel radiators. You can also add to or remove individual sections as required so you have a far more flexible method of radiator layout. Throw in the huge range of heights from 300mm to 2000mm and most in between and you have an amazing array of size options to provide heat to almost any space. Radiators - Particularly of The Designer Kind. Hello Everyone and thank you for taking the time to read my blog. I've been advised by the clever people who help me with optimising our website that we need to start blogging about the things we specialise in. Simply put, we have a showroom in Portsmouth filled with designer radiators and they're telling me to talk about them. Seeing as I know a fair bit about this game, I reckon I'll be able to quickly make this a bit of an authority site, but in the meantime, I thought I'd just post up something practical for people to think on. The thing that differentiates what we sell with the more conventional type of radiator is to do with one simple aspect. They're 'designer'. Now what exactly does this mean? Well, designer in this context refers to it's form, whether cast iron and traditional or modern vertical, the shape and ascetic is a priority. In some cases the ascetic may even supersede the product's functionality, but that's something I'll come to shortly. Designer radiators, whilst not always or necessarily possessing the most efficient way of providing heat in their basic function can actually be the most logical solution and offer the most heat in certain situations. Hmm... That sounds like a total contradiction in the same sentence, doesn't it? Let me explain. Radiators are often only as good as where they're put. Back in the day, if you had heating put in, the plumber would simply ask which wall you wanted the rad on and then he'd bugger off down the plumbers merchant and buy the cheapest model available for your output requirements. Positioning usually meant under the bay window. We've all got rads there, even I have. Fast forward 25 years. The three seat sofa and two armchairs has been replaced by two three seaters (or four seaters if you're really lucky), and the 21" telly is now at minimum a 40" flat screen. Suddenly you're in the realm of bad radiator positioning. That bay window rad is now heating the back of a sofa because you've run out of room and anyone who sits on it in the winter falls into an immediate heat induced coma. The answer is a vertical radiator. Or vertical radiators. Plural. Take a couple of thin tall radiators and put them up either side of the bay window, or either side of the fire place. In most houses (unless you're married to a photographer, like I am) anything above dado height is dead space and this will put it to good use. So you've killed two birds with one stone. You're not putting guests to sleep and you've putting the radiators in the room allowing them to heat the room properly. Thanks for reading. I'll post something else up soon.